Bevo XIV is gone, but his legacy lives on — in the medical field as well as on the football field. While studying the bovine leukemia virus that killed Bevo XIV nearly three years ago, University of Texas associate professor of molecular biosciences Christopher Sullivan discovered a way for human bodies to fight the hepatitis C virus. Hepatitis C, a viral infection that causes liver inflammation, kills nearly 20,000 Americans a year and is currently infecting more than 3 million people in the U.S., according to the UT College of Natural Sciences. According to the research from Sullivan and his team, a naturally occurring protein used by the leukemia virus to contribute to its resulting cancer in Bevo XIV acted very differently when tested on a human hepatitis C sample: It stopped the replication of the infection. 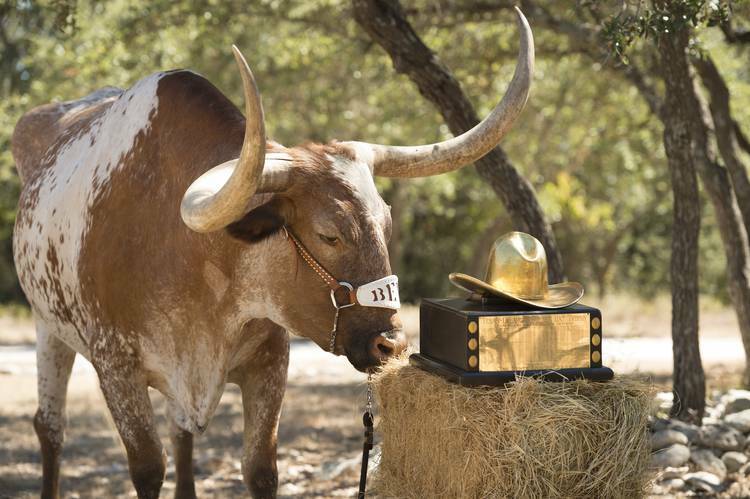 Bevo XIV, also known as Sunrise Studly, was UT’s football mascot from 2004–2015. The National Grand Champion Show Steer measured 6 feet, 3 inches tall, weighed 2,100 pounds and had sweeping, sharp horns measuring 82 inches tip to tip. He first took up the Bevo mantle at the age of 2 died at 13. To read Sullivan’s full abstract and research paper, click here.